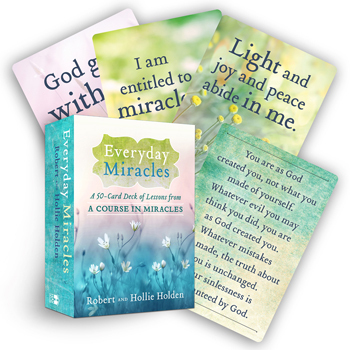 New York Times best-selling author Robert Holden and Hollie Holden present 50 beautifully designed cards, each one featuring an inspired lesson from the international best-selling, beloved spiritual classic A Course in Miracles. A Course in Miracles teaches that the way to remembering God - the path of inner peace - is through love and forgiveness. The unique curriculum it offers has resonated with millions of people around the world, being translated into over a dozen languages. Each of the 50 beautifully designed cards in this deck draws from a lesson in ACIM, explained by two world-renowned teachers of ACIM.